Why would being a professor of sociology be controversial? Because there weren’t any, at least not in France, until Emile Durkheim became the first one in 1887. Up to that time, the study of human behavior was left up to biologists and psychologists. 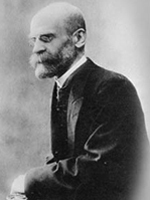 But Durkheim made the assertion-widely disputed at the time-that one can understand people, not by looking at individuals, but only by examining their society. Durkheim’s investigation of suicide, detailed in Chapter 1 (“The Sociological Perspective”), offers persuasive evidence of society’s power to shape human behavior. In this classic study, Durkheim showed that people’s place within the social system-as women or men, rich or poor, Catholic, Jew, or Protestant-affects even this most personal act. Durkheim’s work, like that of Marx and Weber, is discussed in many later chapters. His contributions to the understanding of crime figure prominently in Chapter 8 (“Deviance”). Durkheim also spent much of his life investigating religion, which he held to be a key foundation of social integration (see Chapter 18, “Religion”). Just as important, Durkheim is also one of the major architects of the structural-functional paradigm, which we refer to in almost every chapter that follows.